While in The Simpsons, Homer works at the Springfield Nuclear Power Plant, in real life, it seems like he must work for Krispy Kreme. After all, the sugar-ring purveyor just unveiled a brand new donut that looks like something straight out of one of Homer's thought bubbles. Ahead of the official rollout, Krispy Kreme UK is offering the Nutty Chocolatta donut, a donut filled with Nutella and topped with chocolate and sprinkles, at a pop-up location in London. This "Hole in the Wall" location will act as a sort of donut ATM, dispensing the treat at 229 High Holborn, London from May 9 - May 21, 2016 between 8am - 8pm. If you happen to be in London and can grab a £2 donut, all proceeds will go to the Teenage Cancer Trust, making this a rare opportunity to have good things come from eating a ton of sugar. 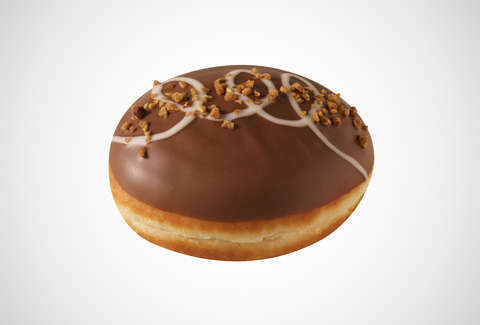 After the initial pop-up experience, the donut will be available at all UK stores for £2 from May 27 – September 4, 2016. No word on whether these will ever be introduced in the US, but if things go well in the UK, there's certainly hope. Until then, you'll have to skip across the pond to get these Nutella-filled dreams. That's one reason to visit London, though hopefully you're not booking a round-trip ticket just for a donut. That'd be excessive -- and you can probably buy a whole lot of donuts and Nutella for the money you'd save. Kara King is a News Writer at Thrillist and might fly over to London just for a donut. Send news tips to news@thrillist.com and follow her at @karatillie.